Another Beautiful Day in Paradise. We had clear blue skies, the temperature in the mid 60s and a breeze out of the North. 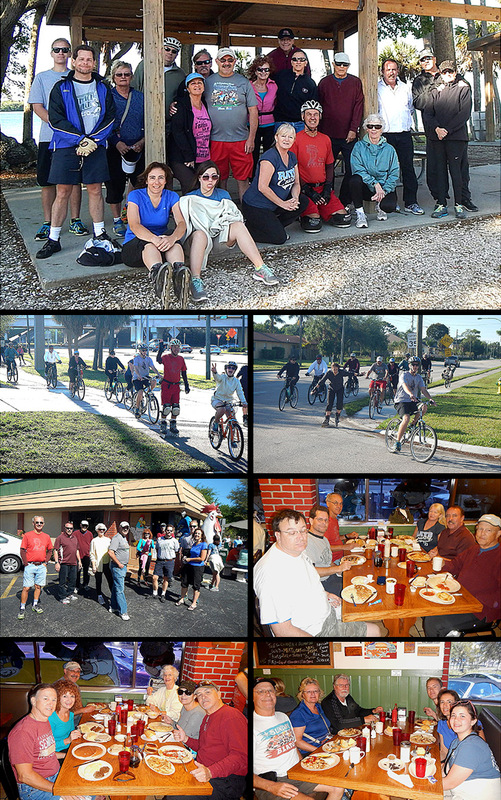 Bladers/Bicyclers Adam H, Dimitri F, Loraine L, Nick S, Amie & Rob H, Andrew F, Sandy & Glenn R, Bruce M, Steve G, Rob H, Rick P & Ginnie S, Wendy H , Kelly H, Deb D, Jeff B and Carol J came. Welcome all. We did the normal Skyway Trail route up to the Pinellas Trail and back for 12 miles. Sandy had new skates and they were giving her some problems so she and Glenn turned around a little early. There were 15 Bicyclers and 4 Bladers. Bill Auer and Roger Townsend renewed their Sponsorship last week. Thanks Bill & Roger for the website support. We Brunched at Skyway Jacks as planned. We got in and seated in about 10 to 15 minutes. Two of the three of our tables got waited on and served fairly quickly. The third table had to wait another 15 minutes or so. Coffee flowed pretty good and the service was so - so. Rob rated his Brunch a 9.5. We'll give Skyway Jacks a 9.3.